BMW Ireland has released details of its new 5 Series Touring, it’s available to order now with prices commencing from €56,590. Customers will have a choice of four engines from launch, with xDrive all-wheel-drive variants arriving later along with additional models. 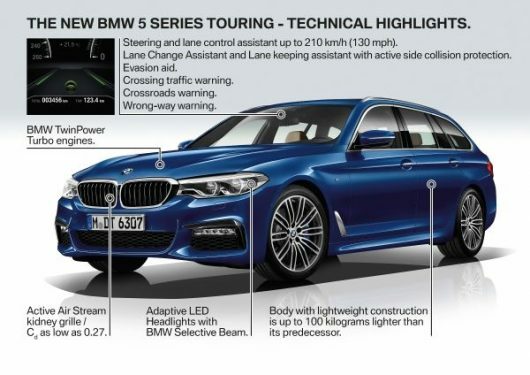 The new 5 Series Touring is 36mm longer than the outgoing model, 8mm wider and 10mm taller, its wheelbase has also been extended by 7mm to 2,975mm. 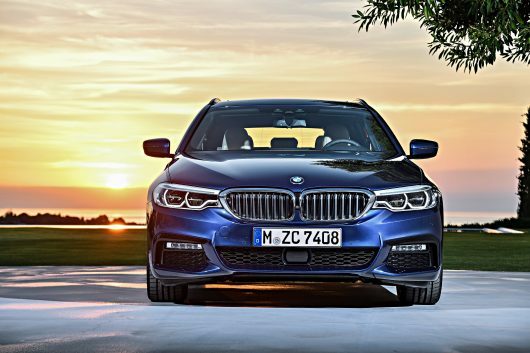 The headlights now extend as far as the BMW kidney grille, which comes with active air flap control, as does the lower air intake in the front apron, meaning the flaps remain closed when little cooling is required. In the closed position, additional vertical kidney grille bars become visible to give the front end a more imposing appearance. Apertures in the front bumper direct air into the wheel arches, where it is channelled along the wheels before escaping again through breathers built into the flanks, reducing air resistance. All models have twin exhaust pipes, either circular or quadrilateral depending on engine and trim. Improvements have also been made to the airflow at the rear of the car and along the underbody. Thanks to these measures, the drag coefficient is now 0.27 on some models. The new BMW 5 Series Touring will be powered by new-generation EfficientDynamics engines, equipped with BMW TwinPower Turbo technology. The 2.0-litre four-cylinder petrol in the 530i Touring delivers 252hp (up 7hp on its predecessor), peak torque of 350Nm at just 1,450rpm, and a zero to 100km/h time of 6.5 seconds. Combined fuel consumption of 46.3mpg and CO2 emissions of 139g/km are an improvement of almost ten per cent over the outgoing model. The 3.0-litre six-cylinder in-line petrol engine powering the BMW 540i xDrive develops 340hp, up 34hp on its predecessor. Peak torque, which has increased by 50Nm to 450Nm and it completes the zero to 100km/h sprint in just 5.1 seconds. Again, fuel consumption and CO2 emissions are almost ten per cent better than on the outgoing model, at 37.6mpg and 172g/km. The petrol engines of the BMW 530i Touring and BMW 540i xDrive Touring come with twin-scroll turbochargers, High Precision Injection direct petrol injection, VALVETRONIC variable valve timing and double-VANOS variable camshaft timing, while new engine encapsulation technology reduces noise and speeds warm-up. The diesel engines are fitted with a BMW TwinPower Turbo package comprising variable-geometry turbocharging and common-rail direct injection. On the four-cylinder BMW 520d, solenoid injectors operating at up to 2,000 bar ensure precise fuel metering and clean combustion, as do the piezo injectors operating at up to 2,500 bar in the six-cylinder in-line engine powering the new 530d and 530d xDrive. Engine-mounted encapsulation on both engines reduces noise levels and speeds warm-up. 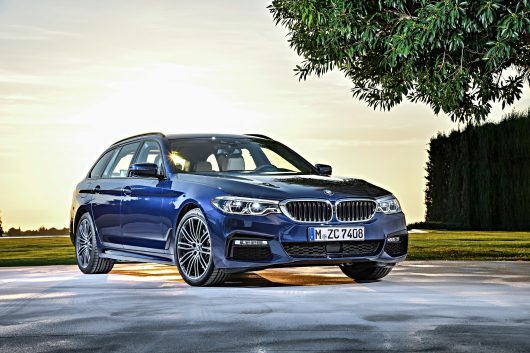 Both units feature BMW BluePerformance technology for reduced emissions. As well as a particulate filter, an oxidation catalyst and a NOX storage catalyst, this package also includes an SCR catalyst with AdBlue injection for additional NOx reductions. 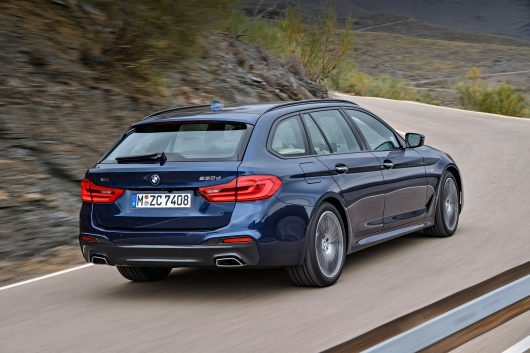 The 2.0-litre diesel unit in the 520d Touring develops 190hp, and 400Nm of torque between 1,750 to 2,500rpm. It does zero to 100km/h in 7.8 seconds, and has combined fuel consumption of 65.6mpg and CO2 emissions of 114g/km. The launch line-up is topped off by a 3.0-litre straight-six diesel developing 265hp and 620Nm of torque. This engine can be combined with either rear-wheel drive or all-wheel drive. The zero to 100km/h times are 5.8 seconds for the former and 5.6 seconds for the latter. 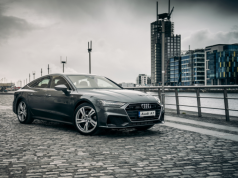 Combined fuel consumption is 56.4mpg for the rear-wheel drive model and 51.3mpg for the all-wheel drive version, with CO2 emissions of 131g/km and 144g/km respectively – an improvement of up to 11 per cent in fuel consumption and emissions over the previous generation. The eight-speed automatic gearbox is fitted as standard on all models. 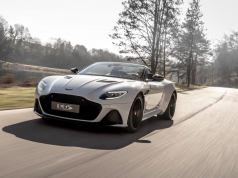 The optional Dynamic Damper Control system allows drivers to optimally adjust the driving characteristics to match their individual preferences. Three different modes can be selected: COMFORT is for normal, comfortable driving (on longer trips, for example), SPORT is the right choice when seeking maximum driving pleasure and ADAPTIVE mode adapts the vehicle’s responses precisely to the driver’s wishes and the driving situation. The new BMW 5 Series Touring offers more luggage space, 570 litres with the seats up (an increase of 10 litres) and a maximum of 1,700 litres, 30 litres more than in its predecessor. The increase in the luggage compartment’s width is particularly noticeable. Standard specification includes operation with an independently opening tailgate window. This combines with the optional Comfort Access feature to allow hands-free opening and closing of the tailgate with a carefully aimed flick of the foot under the rear apron. All models feature innovative storage solutions such as 40:20:40 near flat-folding rear seat backrests, which can be released remotely from the boot at the push of a button as well as load-dividing nets and a practical underfloor storage area in the boot. Standard equipment for the new 5 Series Touring includes not only Collision Warning and Pedestrian Warning with City Braking function, but also Cruise Control with Braking function. The optional Active Cruise Control (ACC) with Stop & Go function can be used at speeds from zero to 210km/h. This can brake the vehicle to a standstill and allow it to move off again automatically after a pause of up to 30 seconds. The result is much less stressful driving, particularly on motorways. The line-up is completed by systems which keep the driver better informed when manoeuvring and provide warning of hazardous driving situations. These include Park Distance Control, rear-view camera, and Surround View that shows a 3D image of the vehicle and its surroundings from various angles on the Control Display, along with a Crossing Traffic Warning System and Night Vision Assist. Other features include a Lane Keeping Assistant, which comprises of Lane Departure Warning system that alerts the driver if the vehicle crosses lane markings unintentionally, as well as a Lane Change Warning which monitors lane changing manoeuvres and helps the driver to steer back into the original lane if a risk of a collision is detected. These systems are complemented by the Side Collision Warning system which operates at speeds between 29–210km/h. This triggers a visual signal and steering wheel vibration if another vehicle is encroaching from the side. If sufficient space is detected on the opposite side, the system correctively steers the vehicle in this direction.